There has been a remarkable revival in at-home sewing that has taken place over the last 5-10 years. Once thought to be struggling remnants of dying industries, fabric and sewing machine sales have rebounded sharply, as a new generation do-it-yourselfers, and folks just looking for a little individual flare to their clothing, have taken up the hobby of sewing at home. Modern day seamstresses and sewers are frequently purchasing their patterns from online designers who sell their custom clothing patterns as downloadable PDFs. One very popular designer whom we have recently begun working with through an affiliate program is Judy Hale of Patterns For Pirates. There are countless others. Some time ago, a few of the P4P seamstresses discovered our large format printing services and realized we had the perfect way for them to get the easy-to-use large format A0 copy shop patterns printed and shipped to their doorstep. No more taping 8.5×11 inch sheets together from home office printers, and no more paying an arm and a leg for a few large format prints at the local print shop or retail office supply stores. We have been printing a lot of A0 format patterns ever since! 1) Create a free account on our site which comes with 500 MB of secure file storage on our cloud. All you need is a valid email address. 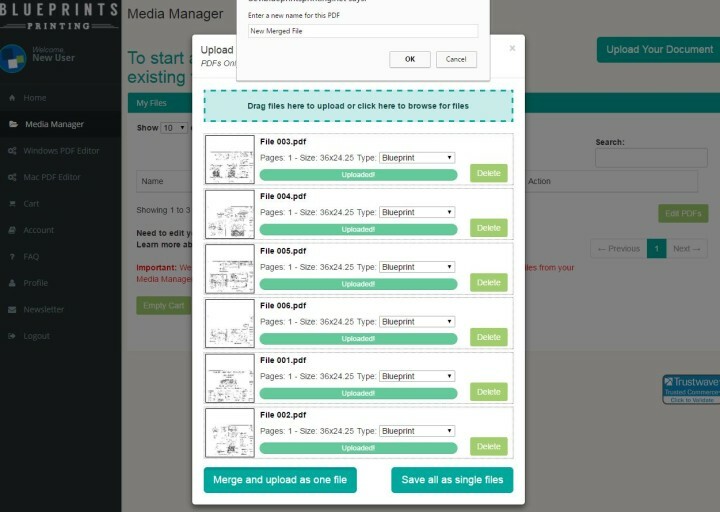 * You can upload multiple files at one time by either dragging them into the upload box, or clicking on the upload box and then selecting multiple files within a folder on your computer with your cursor. 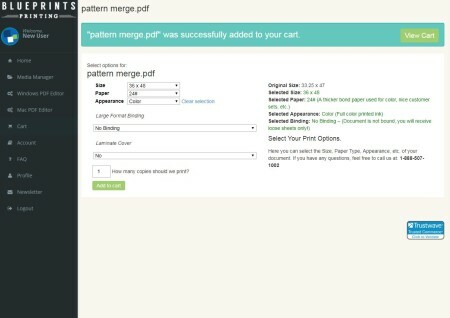 3) If your patterns are all the same size (A0 Format) we recommend the “Merge and upload as one file” button function for a much quicker and easier ordering process. This way you will only have to enter you paper, size, and appearance preferences one time to place your order for all of the prints. You will then need to give this new merged file a name….  Size: Choose the option that is the same as, or one size up, from your original file size. For A0 size files this means choosing the 36×48 option. Paper: 20# is our regular 20 pound bond printing paper; the same as you would use in a home office printer. This is the most common choice for printing sewing patterns, but if you want your pattern in color, or just prefer a thicker sturdier paper, we also recommend 24# or 32#. Vellum is an opaque tracing paper type product and is another good option for sewing patterns. Appearance: Choose whether you would like your pattern printed in black and white, or in color. 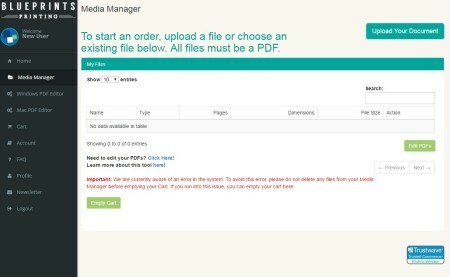 5) If you have completed uploading all the files you would like to order, press the View Cart button to proceed to checkout and place your order. 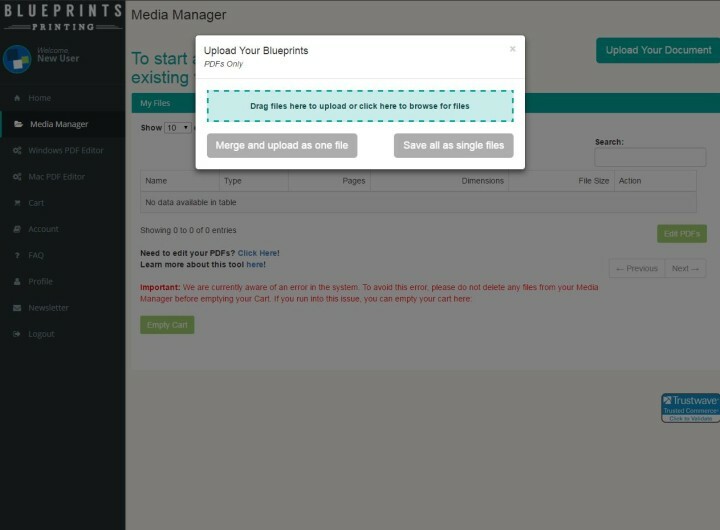 If you need to upload, or order more files click on the Media Manager tab to return to the previous screen and repeat the process above. 6) Once you have all of the patterns you would like to have printed in your cart, you are ready to “Proceed to Checkout.” We charge a $7.00 print set up fee per order. This covers downloading your files, setting them up in the print software, as well as boxing your prints up for shipping. Shipping generally runs between $10.00 and $15.00 for our regular UPS Ground shipping depending on your zip code. We have expedited service available too for a little extra. Printing sewing patterns and having them delivered right to your doorstep has never been easier or less expensive! Start your order today, or give us a call on our customer service line if you still have any questions. We are always happy to help!